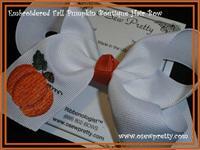 Thanksgiving hair bow's from O' Sew Pretty. Available in many sizes and styles, she'll be the best dressed little girl at your Thanksgiving table. Look for more of our Thanksgiving collection coming soon! You can't eat this Turkey! 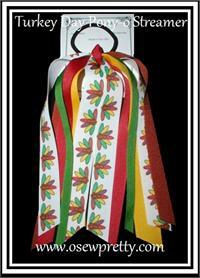 But it sure looks delicious when surrounded by fall colored ribbon and special curlies. The perfect fall accent hair clip. 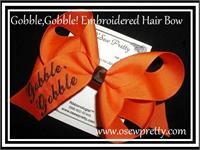 You can say "GOBBLE GOBBLE" with this unique style hair bow. Adorable as piggy tails. Treat her this fall season with a Gobble, Gobble! Thanksgiving Day hair bow. 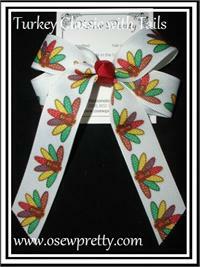 Lots of Festive Holiday ribbon stacked just right then embellished with a Tommy Turkey charm. 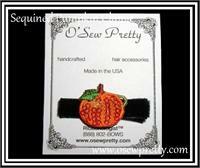 Designer Turkey day ribbon accented with all the colors of the Thanksgiving Day dinner adorn this designer ponytail streamer.